Take a trip back to the times of ancient Greece in this archeological adventure. Click here to play! You'll have to scour the ruins of this once great empire to find hidden treasures that will see you bringing in a hefty paycheck upon your return. The olive branch was a symbol of peace, goodwill and victory in ancient times. You'll be very victorious if you spin the olive branch as it acts as a wild symbol. It will replace most other symbols to aid you in your quest to create winning pay lines. The Pegasus symbol will also help you succeed. Dig up three to five of these across a pay line and you'll get up to 1000 times your line bet. Ancient water jugs will also get you a pretty penny. Three to five of them will earn up to 500 times your bet. Also keep an eye out for ancient battle helmets, olives, statues, shells, Trojan horses and the number 10. All of these symbols of ancient Greece will help you bring in wins. If, in your search of the ancient ruins, you find the Grecian longboats from times past you will be handsomely rewarded. 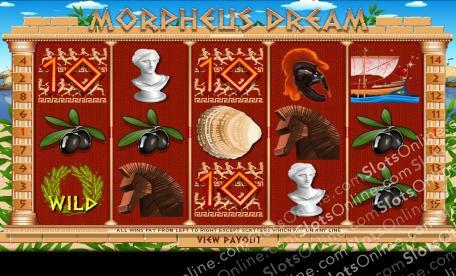 These scatter symbols will get you a number of free spins! The ultimate relic though is the golden coins. Three or more of this ancient money will trigger a bonus feature that will allow you to play for some pretty generous prizes! Scour the ruins of ancient Greece for a chance to dig up treasures beyond belief! Grecian longboats act as a scatter symbol. Spin three or more of these and you'll be rewarded with 5, 7 or 10 free spins. All scatter wins are multiplied by your total bet. The olive branch acts as a wild symbol. This leafy green icon will replace all other symbols except scatters and bonuses to create more winning combinations. The Golden Coin acts as a bonus symbol. If you can spin three or more of these anywhere on the board and you will trigger a bonus feature. During this feature, you will have to choose from a selection of scrolls to reveal your bonus prize.